Looking for Level A and Level B readers for guided reading? ♦He is a Community Helper and She is a Community Helper - 2 pk: Level B Sight-Word-Stages Readers and Writing Activity Set! Reading the color version in a supportive setting (i.e. guided reading lesson), finding humor or a way the child might relate to the story helps to ensure comprehension and interest. The stories come alive in the initial sharing of the color copy. Following up with students’ own black line copies for them to color and practice printing sight words in context is well-received, and they are proud to take it home and share. 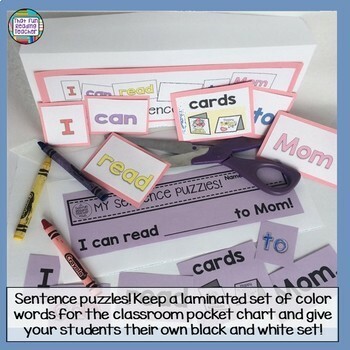 Reassembling sentences with colorful word and picture puzzles that match the reader make a fun literacy center that can be recreated at home with a copy students can color themselves! 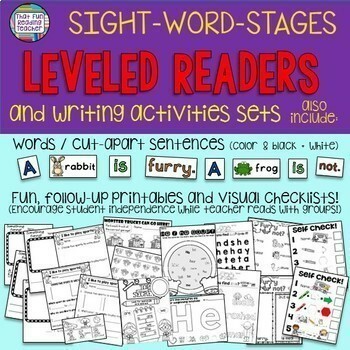 The Sight-Word-Stage Readers and Writing Sets are an ideal way to start a personal classroom Guided Reading library. Keep the colored copies to reuse year after year, and give students a personal copy to color and keep as familiar reading. There are always enough copies, and missing books are easily replaced! A visual checklist is provided to keep students on task with their Sight-Word-Stages readers and follow-up activities, with the final item reminding them to practice reading their book, and reassembling the sentence strips (also included in color and black + white). ♦The Top Three Reading Prompts Bookmarks - Free! ♦FREE: How to make familiar reading fun for kids - strategies for parents and volunteers! 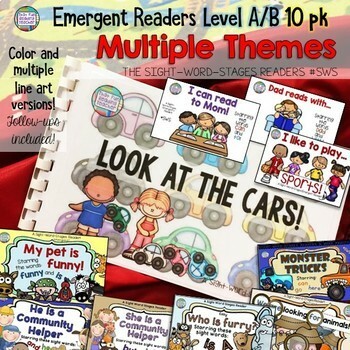 ♦Level aa/A School themed – 5 pack: Sight-Word Readers, sentence puzzles and more! ♦Level aa Fall, Thanksgiving, Halloween Themed 5 pack: Sight-Word Readers, sentence puzzles and more!